Evaluation of Water Conservation Potential for San Carlos Irrigation District (AZ) | WEST Consultants, Inc. The San Carlos Irrigation and Drainage District (District) and the Bureau of Reclamation established an Engineering Board to determine the reduction in water losses associated with rehabilitation of the District’s canal system as part of an Indian water-rights settlement. The District is part of the San Carlos Project, run by the Bureau of Indian Affairs, and which distributes water to the Gila River Indian Community. Dr. Bert Clemmens from WEST Consultants led this Engineering Board. Existing canals are unlined, with significant seepage and evaporation. 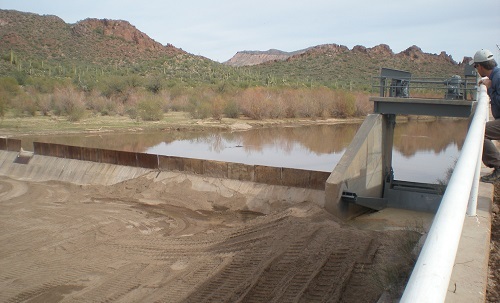 Flows diverted from the Gila River contain large amounts of sediment. Total losses are on the order of 40% to 60% of District supplies. The Engineering Board was charged with identifying seepage and evaporation losses associated with each canal and lateral. Inflow-outflow tests were performed to evaluate losses in test canals. Additional losses included canal spills and under-reported water delivered to users. WEST developed water budgets for the entire District and for four different canal systems (canals and associated laterals). These water budgets helped to distinguish different types of losses in different parts of the District. The results of the loss studies were used to identify canals that needed to be lined, and thus aided in the modernization process.